As with all aquatic life, the initial state of health, suitability of the overall environment and presence and degree of pathogenicity of disease-causing organisms all figure into the equation of health: disease. As goldfish keepers we need to do our best to pick out healthy specimens, provide them with an optimized, stable setting and ward off the introduction and proliferation of biological disease agents. Here is a review of the principles of goldfish disease prevention, a listing of the causative mechanisms of the principal diseases of this species and a detailing of possible treatments for these causes. Folks who would keep healthy goldfish should know a few basic facts re their biology, in order to in turn provide for their husbandry. First off, goldfish are all the same species, Carassius auratus (some folks believe their actually a cross with another species), hence, like domestic dogs, all are potentially interbreeding and have similar (though far from identical) care. Comets and Shubunkin varieties are tougher, more resistant to sources, degrees of stress than the "fancier" sports/types of goldfish (e.g. Ryukins, Lionheads). Some kinds of goldfish are so fancy that they should not be placed with more "stream-lined" members of their same species (e.g. Bubble Eyes, Pom Pom Telescopes) for fear that they will be out-competed for food. Goldfish are cool to cold water animals, and though they will tolerate occasional "tropical" temperatures (into the 80's F) they are best kept at temperatures in the 60's to low 70's F. consistently. What is trying to be emphasized last is the need for a large (not a bowl but an aquarium or pond) of large volume (a few to several gallons per specimen) AND the possible use of a thermostatic heater set low to come on in the evenings or otherwise during times of too low, quick drops in temperature. Goldfish need cool temperature water that does NOT change much or quickly thermally'¦ a few degrees F. a day, else they become over-stressed'¦ and much more susceptible to other disease. Due to their cooler water needs (and often their "dirtiness") goldfish should NOT be housed with tropical fishes. This being stated, there are not-so-tropical fishes sold as warm water species'¦ Using resources like fishbase.org and www.WetWebMedia.com and books can give you insight as to matching temperature and temperament species that go well with goldfishes. Being coldwater minnow fishes, Goldfish have different nutrient requirements than tropical fishes. Feeding them high animal content, high protein foods is a mistake that can lead to fatty degeneration disorders internally, "gas bladder" orientation syndromes (fish unable to keep themselves spatially stable), and outright death. Goldfish need foods formulated for their toothless jaws, long, spiraled digestive tracts. Goldfish are largely raised in outdoor settings, and often need a period of adjustment, quarantine and treatment before being mixed in with an established collection. This prevents the transmission of parasitic disease mainly, but also gives newly acquired specimens rest to adapt to captive conditions. If Anchorworm or Fish Lice are going to show for instance, you would rather they did so NOT in your main tank. 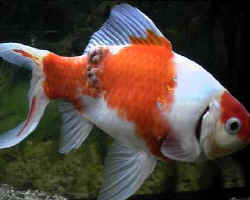 Goldfish are "dirty" fishes compared with tropicals, saltwater'¦ they eat a lot and defecate accordingly. Their systems need beefed-up aeration, circulation, filtration and regular partial water changes to maintain cleanliness. Undergravel filters are not for serious goldfish keepers, they need box filters and/or outside/inside power filters'¦ and regular attention to cleaning/renewing filter media, at least once a week. A disease can be defined as "any deviation from a normal or healthy condition". As such there are many kinds of disease and a few approaches one may elect to delineate them. By their etiologies (causative mechanisms), treatment approaches, appearances'¦ I have chosen the first. The single largest source of mortality/loss of goldfish is this category. Simply put, most goldfishes are killed through direct environmental challenge, mostly from their own pollution, in being in too small a volume of water, without sufficient aeration or filtration. Goldfish need space'¦ yes, you can keep "comets" aka "feeder goldfish" in a bowl of small size for a short while'¦ but not very long. This same American sport attains a good foot in length and lives for twenty or more years when kept properly. Is it fair, reasonable to suffer it to a dirty, shortened, painful life by placing it in a small, often unfiltered, not temperature controlled setting? All goldfish need a few to several gallons per individual to live well, depending on their size/age. Large adults of all breeds should have a good twenty gallons minimum per specimen. Smaller size systems, crowding are positively correlated with problems like stunted growth, bent fins, and susceptibility to pathogens. A simple set of test kits for measuring aspects of nutrient accumulation in the way of nitrogen compounds will greatly aid you in assessing environmental quality. Ammonia and nitrite in particular are commonly to blame in self-polluting causes of goldfish disease and death. Basically, goldfish produce ammonia as a waste product. Over time groups of bacteria become established in the system (on hard substrates and filter media) that convert this toxic ammonia (NH3, NH4OH) to still toxic nitrite (NO2) compounds, which in turn are converted to nitrates (NO3). The accumulation of nitrate should also be guarded against by careful feeding, undercrowding and regular water changes, but ammonia and nitrites are real killers that should never exceed 1.0 ppm in concentration. Poor food choices and mis-feeding are another huge category of goldfish cause of loss. Swim bladder/orientation anomalies and many "mysterious deaths" of otherwise healthy-appearing individuals can often be traced to nutritional cause. A few general cautionary notes here re goldfish feeding. Feed less. When, where in doubt, don't feed'¦ goldfish only need to eat about as much food as their eye volume per day'¦ Sure, they will gladly keep gorging themselves if you insist on offering more food. It's not good for them, or their system. Feed twice daily. For most set-ups, goldfish, twice daily feedings of said small volume of flakes, pellets, sticks or some prepared human food if you prefer (e.g. cooked rice, oats, cooked or blanched zucchini, peas'¦) is sufficient. When/where in doubt, leave it out is the slogan to bear in mind when feeding your goldfish. They very rarely die of starvation, but are VERY often killed as a consequence of over-feeding. Feed appropriate foods. Take stock of what is in the foods you feed. Mixing goldfish foods is not necessary, as the formulations made for them are "complete". Some "color" foods have more protein content, but by and large you want to shoot for a staple food that has 20% or so total protein by dry weight. If your goldfish show signs of poor buoyancy control or you lose one or more for no apparent reason, it is suggested that you cut out all high-protein foods, add a teaspoon per five gallons of Epsom Salts to the system water, and restrict feeding to a minimum for a few weeks. If your fishes are so mal-affected it may be prudent to lower the water level to just a few inches, to facilitate their movement and feeding. Considering the odd appearance of many goldfish varieties it's hard to say at times which are actually genetically "diseased" or "just bred that way", however there are some anomalies that are common. Such characteristics as congenitally bent or notched finnage, a lack of an eye or mis-shapen mouth should be selected against. You should know and select for quality specimens when purchasing goldfish, and if you should become a breeder, cull these defective specimens. Some traits, such as late change in dark color in Orandas and Moors can be tolerated, even expected, but other than these developmental changes, imperfect mutants should be destroyed. Goldfish are parasitized by several groups of organisms. For our purposes we can divide them into animal categories of worms, crustaceans and Protozoans'¦ and they can be treated according to these same classifications. Worm parasites: A group of flatworms called monogenetic Trematodes (monogenetic for their direct life cycle, that is, not requiring an intermediate host) aka "flukes" are common on newly imported goldfish, occurring on both the body and gills. Without a microscope they cannot actually be seen, but their effects can be. Torn fins, colorless and split gill filaments, general malaise and a difficulty in breathing are some signs of their presence. New fishes can be run through a preventative bath of a few minutes duration with a formalin or formalin and malachite bath, or prophylactically treated with Fluke Tabs, Droncit, Copper solutions, or more dangerously potassium permanganate. These treatments need to occur over a period of two weeks or so, every four days to eliminate both the egg-bound, juvenile and adult-feeding stages. Crustacean parasites: These are principally Anchorworm and Fish Lice, the former appearing like a two pronged stick and the latter a flattened disc with dark eyes as adults holding on to their fish hosts. Both these crustacean parasites "come in" from pond-raised stock and can be treated with organo-phosphate insecticides. Usually DTHP (aka Masoten, Dylox, Neguvon'¦) or Dimilin sold in small quantities for this purpose AND the physical removal of adult forms from the fish. This is done with a forceps or tweezers, netting the fish and holding them by hand, grasping the parasite near the site of insertion and pulling it caudally (toward the tail). Some folks dab (with a cotton swab) a bit of iodine or mercurochrome on the wound sites. Protozoan parasites: Goldfish are susceptible to those twin scourges of tropical fishes, Ich or white-spot and Amyloodinium or velvet disease, in addition to a host of other single celled nasties (e.g. Chilodonella, Epistylis, Trichodina, Costia'¦) that w/o the use of a microscope, some staining of skin and slime samples are not possible to discern. Other than the white spots of Ich, these other infestations can look like white patches, drooping fins, labored breathing'¦ Their treatment involves chemical preparations like malachite green, copper, formalin and salt ("regular" non-iodized sources, at about a teaspoon per five gallons) over a period of two weeks. All chemical treatments require removing live plants and chemical filtrants (e.g. activated carbon) from the filter flow path, and using regular testing of water for ammonia, nitrite'¦ with new water on hand for diluting same. The balance between goldfish health and disease is easily tilted toward the latter when a lack of understanding these fish's basic needs is practiced. Goldfish are coldwater animals that need room to move, breath'¦ and filtration, circulation to remove their copious wastes. If their environmental conditions are met and one takes precautionary measures (dips/baths, quarantine of new stock), few real problems are likely in their care. Should a parasitic disease show up, fast identification and treatment is necessary to resolve the situation. Noga, Edward J. 1996. Fish Disease, Diagnosis and Treatment. Mosby-Year Book, MI. 367pp.